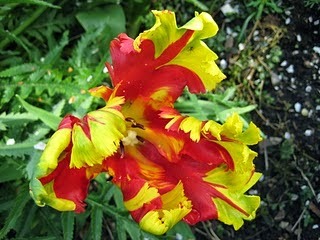 This is a tulip and I think the assortment is Texas Flame. I worship the pretentiousness of these blossoms. I don't generally like my blooms showy particularly in my own particular arrangement, yet I have a genuine weakness for these extreme tulips. I see totally why there was tulip lunacy in the seventeenth century, and immense entireties of cash were paid for tulip globules. Who would have the capacity to oppose, in the event that you fit in with the gentry? These "flared" tulips, are at times called Rembrandt tulips after the Dutch craftsman and in spite of the fact that he didn't paint them, other seventeenth century Dutch specialists did. The bi-colouration was at first the consequence of the plants being tainted by tulip mosaic infection which brought on the robust colors to "break", yet now they are more prone to come about because of the trials plant rearing . Notwithstanding they are brought on, I generally think they look like parrots' plumes. Rosé garden is a free software digital audio workstation program developed for Linux with ALSA and QT4. It acts as an audio and MIDI sequencer, score writer and musical composition and editing tool. It is intended to be a free alternative to such applications as Cubase. Software synthesizer is available as a plugin, and it is possible to use external MIDI synthesizer, hardware or software (such as FluidSynth or TiMidity++) in order to make any sound from MIDI compositions. Recent versions of Rosegarden support the DSSI software synthesizer plugin interface, and can use some Windows VST plugins through an adapter. I have been a little remiss with posting for the last week, but would like to invite you to a quick tour around the garden now. The pocket handkerchief size of my blessed (fraction of an) acre is best seen from one of the bedroom windows. The little pond where the frogs continue to spawn is top right of the picture, beneath where the Autumn cherry is blossoming. It always does better in Spring. These frogs seem to have joined a silent monastic order, unlike the Pacific chorus frogs, mentioned here. Same view from ground level- the daffodils are wearing their golden robes to great effect. One of the smaller ones is this little beauty, complete with a slug chew mark. They've started already. I can't remember the variety. These lovely purple crocus have opened in the last two days-they are still in the unspoiled stage. I do like crocuses, but wish they lasted a little longer. Such is the transience of beauty. And in the summer perennials bed, where the fennel has started into growth, a tiny multi- headed jonquil type daffodil is just coming into flower. A walk to the allotment, where the soil is very wet after the recent heavy rains, has produced a burst of rhubarb growth. Hooray, not long now until the first rhubarb crumble.